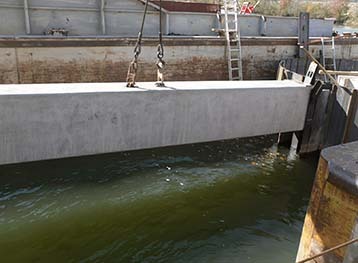 Aquarius Marine supplied all personnel, equipment and material to reconstruct the skimmer wall for the Kingston Fossil Plant, which was damaged during the release of about 5.4 million cubic yards of fly ash and bottom ash into adjacent waterways. The work included constructing 3 each 20’ diameter by 45’ tall concrete filled circular sheet pile cells and the installation of 32 precast concrete beams ranging in weight from 40 to 60 tons. 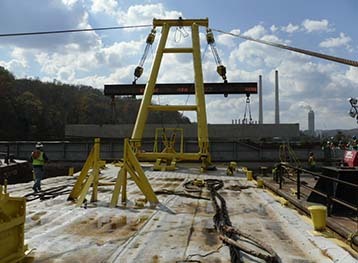 All work was performed on the Emory River using floating equipment. Throughout the work Aquarius Marine complied with the Tennessee Valley Authority Safety Manual and the Site Wide Safety and Health Plan for the Tennessee Valley Authority Kingston Fossil Plant Ash Release Response. Aquarius Marine provided in-house designed critical lifts, in compliance with Safety Procedure 721, that were overseen by Tennessee Valley Authority approved riggers and crane operators. For each definable feature of work Aquarius Marine created “Step-Text” work packages that were compliant with Tennessee Valley Authority / Jacobs Procedure SOP-PM-004. Schedule on this project was critical, as the Tennessee Valley Authority was constrained by a deadline imposed by its insurance carrier. Throughout several owner initiated changes to the work, Aquarius Marine worked with the Tennessee Valley Authority and Jacobs Engineering to complete the work by the December 21, 2010 deadline. Not only did Aquarius Marine complete the work by the imposed deadline, but all work was completed approximately 3 weeks early. The total project duration was approximately 2.5 months. For its work associated with the project, Aquarius Marine received a letter of thanks from Stephen H. McCracken, the General Manager for the Kingston Ash Recovery project, and Jack Howard, of Jacobs Engineering.